I wish I was talking about Golden Lotus rep farming but, alas, I'm still not revered with that faction. No, I'm talking about farming the plants. Literally. In my little plot of farmland with the Tillers, I have always planted 16 Enigma Seeds and used to get the occasional Golden Lotus. At the beginning of last week, though, I started to get multiple lotuses every day. I even got 13 one day; should've taken a screenshot of that epicness. Every day for the rest of the week, I would get at least 4 lotuses. I thought maybe I was just having a string of VERY good luck with my plants but my husband started getting some every day, too. I doubt it's just us that are winning with this. Anyone else noticing this buff to the chance for lotuses? Above is what a typical farm plot for me looks like these days. Not that I'm complaining! While we're on the subject, I would also like to give a big hug to whichever Blizz employee thought of the "profession plants." 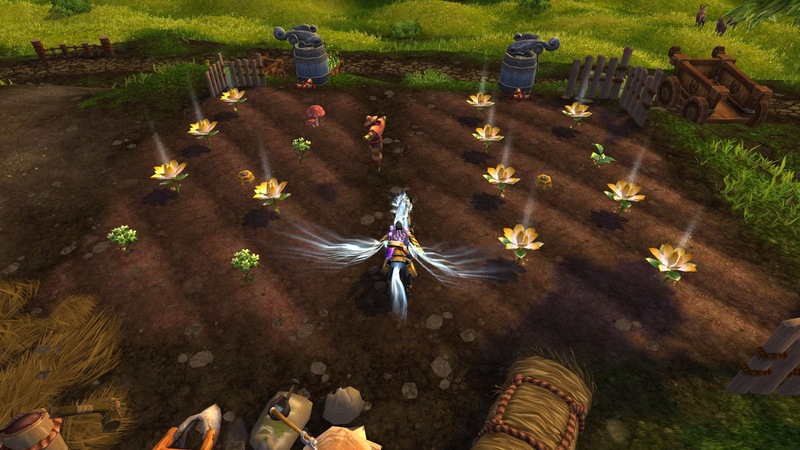 These plants come in especially handy for herbalists and miners since Blizz nerfed the amount of nodes that spawn in Pandaria. Totally wrong and unnecessary, in my opinion, considering how annoying it is to gather these nodes. How many of you have had your nodes swiped from under you by an inconsiderate player who snuck in while you were clearing mobs to said node?I know it's happened to me. A lot. And the ridiculous amount of nodes that used to spawn in Pandaria have made this happen considerably less. Not so much anymore, though. Que sera sera, I guess.